Brief Synopsis: Deadman recruits the Justice League for a trip into Limbo. 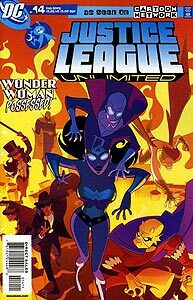 Booster Gold is among the Justice Leaguers present when Deadman possesses Wonder Woman. Also present are Batman, Flash, Green Lantern (John Stewart), Martian Manhuinter, and Superman. Booster Gold asks Flash to explain who Deadman is. (This is apparently Booster's first JLU meeting with Deadman.) In this issue, Booster acts as an audience surrogate, a literary vehicle for explaining necessary concepts to the reader. This is a familiar role for the character of Booster Gold, as he is typically portrayed as inexperienced compared to his fellow heroes. Having completed his role as the mouthpiece for story exposition, Booster Gold makes his final appearance in this issue.